Is Manchester United's winning streak over? 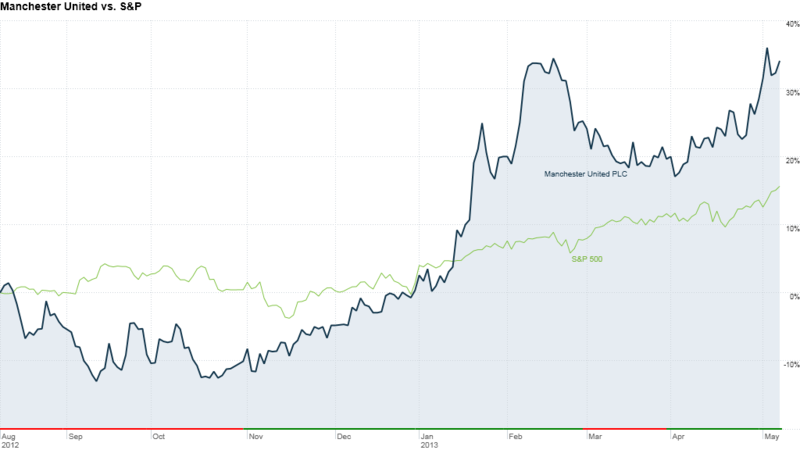 Shares in Manchester United have surged by nearly 35% since the club listed in New York in August 2012. Shares in Manchester United took a tumble Wednesday after the soccer club's most successful manager said he would retire after 26 years on the job. Sir Alex Ferguson, who has led Manchester United (MANU) to victory in the English Premier League 13 times since its inception in 1992, is stepping down at the end of the month when the season closes. "This increases the risk of investing in Manchester United. It's like when Apple (AAPL) lost Steve Jobs," said sports business expert Emmanuel Hembert from management consultancy A.T. Kearney. "Ferguson is really the key executive that is the core of the business." Shares in the company, valued at $3 billion, had gained nearly 35% since its New York IPO in August 2012, easily outperforming the benchmark S&P 500 index. They fell as much as 5.5% Wednesday before trimming their losses later in the session to end just 1.8% lower. The shares have also trounced the STOXX Europe Football index, which tracks other publicly-traded soccer clubs including Italy's Juventus and Germany's Borussia Dortmund. That index has risen by less than 5% over the same period. Manchester United's winning team, brand and management are considered to be key reasons behind the company's impressive share price performance. But uncertainty now hangs over the stock since it is not clear who will replace the 71-year-old Scot. "Replacing Alex Ferguson is a monumental task and one that shareholders will watch with great interest and nervous uncertainty," said Joshua Raymond, a market strategist at City Index in London. "The man who replaces Sir Alex Ferguson is a significant factor in shareholder confidence." Manchester United has admitted that a large risk for the business is retaining key personnel, saying in its 2012 annual report that "any successor to our current manager may not be as successful." A.T. Kearney's Hembert says investing in soccer clubs, even a well-run operation such as Manchester United, is a high-risk strategy. "It's a non-sustainable business model," he said, explaining that much of the money that clubs make usually gets funneled towards star players. The company raked in £320 million ($503 million) in revenue in the year ending June 30, 2012, and estimates it has more than 650 million followers around the globe. The Florida-based Glazer family, which owns the NFL's Tampa Bay Buccaneers, bought the English club in 2005 and retains nearly 60% of the company after last year's New York listing. Manchester United is a rare example of sporting, commercial and stock market success in the soccer world. Many other clubs are privately owned by wealthy individuals. For example, the rival Manchester City team is owned by Sheikh Mansour bin Zayed Al Nahyan from the United Arab Emirates. Bets are now being placed on who will fill Ferguson's shoes. Names at the top of the list include Portuguese manager Jose Mourinho, formerly of Chelsea and currently at Real Madrid, and Everton manager David Moyes. Ferguson's retirement coincides with another departure from the team. CEO David Gill will be stepping down from his position at the end of June. He will be succeeded by executive vice chairman Ed Woodward.